Last week a ConservativeHome survey of party members identified a sceptical attitude towards environmental taxes. A report today from the TaxPayers' Alliance argues that the nation is already paying too much green taxation. The TPA estimates the social cost of Britain's carbon emissions as £11.7bn but notes that Britain already pays £21.9bn in green taxes. Today the TaxPayers’ Alliance releases a report setting out the state of green taxes in the UK today. Our findings are stark. We already pay far too much in green taxes, £10 billion or £400 per household per year. This result isn’t based upon some new and controversial understanding of the science. The estimates we use of the harms resulting from global warming are taken from the reports of eminent climate scientists, William Nordhaus and Richard Tol, British civil servants, Sir Nicholas Stern, and the UN body usually cited as the ‘scientific consensus’ on climate change, the IPCC. We compared their estimates of the harms, now and in the future, of climate change with the actual amounts of green tax charged, net of road spending. The logic of green taxes is that if polluters are made to pay the social cost of the emissions they put out then they will balance the value to them of emitting against the social cost and the optimal amount of carbon will be emitted. 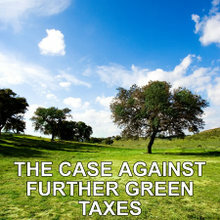 We found that green taxes have been set too high. > They are chronically unfair. Motorists pay VAT, industrial firms pay other business taxes – putting a big additional burden on these groups is deeply unfair. A couple of examples: the Climate Change Levy costs the North 35 per cent more than the South; Fuel Duty and Vehicle Excise Duty cost every motorist between £548 and £743 more than the cost of building roads and the social cost of road transport emissions. This unfairness also distorts the economy by, for example, favouring any firm that doesn’t need to move goods around the country. Green taxes are also often regressive, Fuel Duty hits those on middle and low incomes hardest while any tax on electricity generation will be passed on to consumers and hit the poorest. > They hurt our economic competitiveness. Many other countries do not set green taxes at all and few have set them as high as we have. You can see the difference in the negotiations over the European Union Emissions Trading Scheme where every other country played the system to avoid their firms paying while our government didn’t. British firms ended up paying a £470 million subsidy to firms in other European nations. It can undermine the emissions savings from green taxes if economic activity moves to countries like China whose industry is less energy efficient but where green taxes are not levied. > Finally, they are inefficient. Air Passenger Duty hurts the British tourism industry by discouraging people from flying to Britain – it might also increase emissions by encouraging people to fly further within its long and short haul bands. Even the government’s Regulatory Impact Assessment – a measure thought to underestimate the true cost of regulation - for the EU Emissions Trading Scheme suggested it would cost £60 million per year in administration costs alone. These costs make new green taxes, without a genuine environmental rationale, a very bad idea. They are also politically dangerous. New polling for the TaxPayers’ Alliance shows that the public are split roughly evenly on the question of whether additional green taxes should be charged (46 per cent disapprove while 45 per cent approve), however, one in four people are strongly opposed against only one in ten who are strongly in favour of new green taxes. People are also very cynical about politicians who support green taxes. 63 per cent agreed with the statement “Politicians are not serious about the environment and are using the issue as an excuse to raise more revenue from green taxes”. Politicians think that green taxes makes them sound responsible and caring, the reality is that to most of the British public they just sound phoney. A better move would be to think about cutting some green taxes that are set at excessive levels. Fuel Duty, for example, is thought of as an unfair tax by 60% of the public; just 17% think it is fair. It is paid by people on middle incomes and in the commuter belts where there are so many marginal seats. Excess green taxes are both a bad idea and politically dangerous. The politicians of all major parties who have endorsed them should think again.